There are three artists known as the Soul brothers: 1/ a heavy/power metal band from Lithuania, which is called Soul Stealer now. 2/ One of several studio groups led by reggae keyboard legend Jackie Mittoo. 3/ A Soweto based South African group known as the Soul Brothers, who play in the afrobeat style. They did, over the course of their existence, help define the sound of South Africa. Their particular take on mbaqanga -- the ubiquitous township jive -- has made them stars in their homeland and many parts of the world, with more than 30 albums covering their time. a heavy/power metal band from Lithuania, which is called Soul Stealer now. One of several studio groups led by reggae keyboard legend Jackie Mittoo. 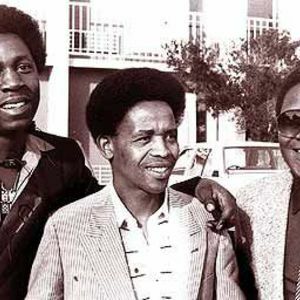 A Soweto based South African group known as the Soul Brothers, who play in the afrobeat style. They did, over the course of their existence, help define the sound of South Africa. Their particular take on mbaqanga -- the ubiquitous township jive -- has made them stars in their homeland and many parts of the world, with more than 30 albums covering their time. Singer David Masondo.and keyboardist Moses Ngwenya have been playing together since 1976.